AFLW player art. Tayla Harris limited edition print. 43cm x 32cm. Carlton Blues. SAINTS ART. St.Kilda FC, 1888. Limited edition Giclee fine art print. Richmond v Footscray. (A1) limited edition Giclee print. Punt Road Oval, 1904. Carlton v South Melbourne, 1907 VFL G.Final. A1 Limited edition Giclee print. Giclee fine art print. Geelong FC 1896, Corio Oval. Limited edition of 175. Football art by DJ Williams. KEILOR FOOTBALL CLUB, 1908. Limited edition print. 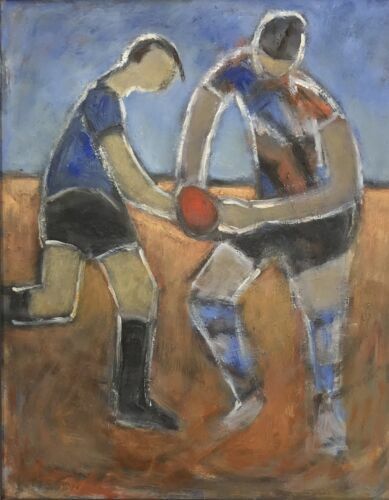 PAINTING Essendon - original "Windy Hill's #5" 85 x 85cm; EFC - the Bombers! Richmond FC, 1889. (A1) Limited edition Giclee fine art print. TIGERS HISTORY. Adelaide Crows player art print - Rory Laird. (A3) 43cm x 32cm. West Coast Eagles player art print - Liam Ryan. (A3) 43cm x 32cm. Essendon FC Art. Alan Belcher, 1906-1919. Limited edition fine art print. COLLINGWOOD FC ART. "Lardie" Tulloch 1894-1904. Limited edition fine art print. Limited edition fine art print. Essendon v Collingwood, EMCG, 1909. Geelong FC, 1896, Corio Oval. Limited edition Giclee fine art print. North Melbourne Kangaroos player art - Jack Ziebell. (A3) 43cm x 32cm. Carlton FC, 1891. (A1) Limited edition Giclee print. Blues History Art.